At Edgbaston, “the times they are a changin’” according to our special correspondent Bob Dylan. Jonathan Trott has retired and other stalwarts such as Keith Barker, Chris Wright, Boyd Rankin and Josh Poysden have moved on. Of the team that won the County Championship back in 2012, only Ian Bell, Tim Ambrose and Jeetan Patel now survive. Important though these departures are, the most significant event may well prove to be a change off the field, with the arrival of Paul Farbrace as Sport Director in place of Ashley Giles. Farbrace will know that he is inheriting a playing squad in transition. The team may have won promotion from Division Two of the Specsavers County Championship at the first time of asking last season. But the failure to qualify for the knock-out stages of either of the two white ball competitions was disappointing. It was especially galling that in both the Royal London One Day Cup and the Vitality Blast, it was Birmingham born Moeen Ali who ensured the Bears’ elimination by producing match-winning performances against them for rivals Worcestershire. Farbrace’s skills in developing young players will be fully put to the test. Who will fill the gap left by Trott’s 1200 runs in all competitions last year and the 80 plus wickets that Wright and Barker claimed? And what if Ian Bell struggles to return after his foot operation? He scored a magnificent 1600 runs last year. Farbrace has pointed out that last season, there were too many players who excelled in one or two but not all competitions and that this needs to change. Maybe he was thinking of Sam Hain who averaged over 100 in the Royal London but was mediocre in the Championship. Or maybe it was Vitality Blast star Adam Hose who struggled to make an impact in the four day game. 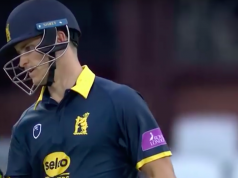 With Ian Bell out for at least the first part of the season, there will be plenty of opportunities for Hain and Hose as well as Ed Pollock, Matt Lamb and Liam Banks to nail down batting places. As for the bowling, little may be seen of Chris Woakes who is likely to be on England duty when he is not nursing a chronic knee injury. But Craig Miles, imported from Gloucestershire, has made a big impact in pre-season games. So if fellow ex-Gloucestershire man Liam Norwell can also make the transition to Division One cricket and both Olly Stone and young Henry Brookes can get back to fitness, the pace attack looks strong. Oliver Hannon-Dalby, Ryan Sidebottom and George Panayi will also provide seam bowling back-up, likely to be needed in a long season where injuries can disrupt the best laid team plans. As for spin, the Bears will as usual look to Jeetan Patel to wheel away day after day. He played in all 36 matches last year and took 77 wickets. Patel will be 39 in May but, like Cleopatra, age cannot wither him. Nor can custom stale his infinite variety of off-spinners. If Patel needs spin support, it will most likely come from Alex Thomson, a highly promising off-spinner recruited from Staffordshire. Olly Stone took 62 wickets in all competitions last year, bowling at such genuinely high pace that he reminded older Bears supporters of White Lightning himself, the great Allan Donald. Stone is by no means the complete fast bowler that Donald became. However, he was good enough to make his one-day debut for England in Sri Lanka. He had a serious knee injury a couple of years ago, from which he seems to have made a good recovery but he had to drop out of the England tour of West Indies with a back injury. Having Stone fit and firing (but not called on too often for England) would make an enormous difference to the strike power of the Bears’ attack in all formats. Local boy Henry Brookes is only 19 but last year, he made a real impact in the first half of the season. Bowling with real pace, he took 37 wickets across the three competitions. He also struck a couple of Championship half centuries. Then he sustained a stress fracture of the back and has not played since. By all reports, Brookes should be back in action soon; and if he can stay clear of further injury, he looks to be a fantastic prospect. Since 2009, Jeetan Patel has played every season for the Bears except 2010. He will return to Edgbaston after another full season for Wellington in New Zealand. Made club captain in 2018, this year he will lead in all three competitions. Australian Ashton Agar will join for the T20 Blast. The left-arm spinner will be available for entire #Blast19 campaign. Whilst he has a decent T20 record as a left arm spinning all-rounder, he is hardly the most exciting signing; and he leaves the Bears without a wrist spinning option which increasingly is seen as de rigueur for all successful T20 sides. Overall, it may be that Farbrace’s aim for the Bears to win a trophy may have to wait a season or so. Survival in Division One plus maybe reaching the knock-out stages in both one day competitions would not be too bad at this transitional stage. If, however, the injured trio of Bell, Stone and Brookes come charging back at full fitness, who knows what might be achieved?